With a break in the weather for the weekend and into Monday, lots of anglers made the most of the conditions. Double Island produced a mixed bag of Scarlet sea perch, tusk fish, pearlies, sweetlip and snapper. The lighter currents allowed well baited paternoster rigs to get to the bottom and win the day for most. North reef has been producing sweetlip, standout spotty mackerel, pearlies and small snapper. Again these fish mainly taking baits fished on paternoster rigs. The mackerel were taking pilchard floaters and floated live baits too. In closer to home Sunshine reef has been producing cracking coral trout, the occasional Spanish and spotty mackerel. The trout have been hitting live yakka and slimy baits as well as fresh baits of mullet and gang hooked pilchards. After the rains on Tuesday the Noosa River had a good flush and with it the fish started to liven up. Around the tide changes, anglers have been getting good numbers of jacks and flathead especially around the mouth of lake Cooroibah and Cootharabah. Between the lakes the jacks have been chomping on live baits with schools of trevally, especially big eyes keeping lure anglers busy. Lower down the river mouth is producing some whiting and bream and around the sand bags we have seen some bigger flathead, mangrove jacks, tailor and trevally. These fish have been taking whitebait and mullet baits as well as soft vibes and bigger paddle tail plastics. Mud crabs have been showing up so load up on mullet heads and set your pots along the mangrove edges. Surf fishing started to warm up with small dart and bream being the main catch. After dark there have been a few good tailor caught on whole gang hooked pilchard baits and even the occasional jewfish has been taken during the dark on bigger fresh mullet, squid and pilchard baits. 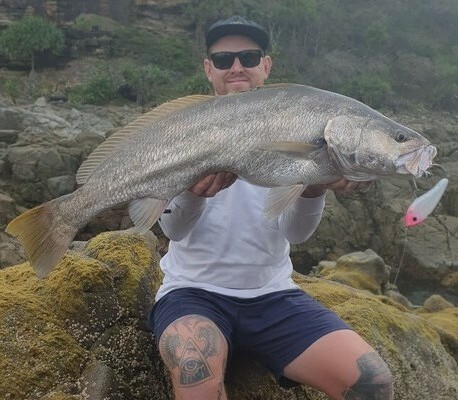 The whiting have also featured around the various river mouths along the coast with fresh worms and yabbies the better baits when fished on lighter running sinker rigs. Freshwater has certainly warmed up with Lake Mac Donald the pick which has been producing saratoga and bass. These fish falling for just about anything you can throw at them. Be sure to carry a wide range of surface lures and shallow diving hardbodies. Spend time casting at likely areas and work the water column thoroughly before moving on. Look for submerged timber and overhanging trees that provide shelter from sunlight and wind.